Heat oil in a medium saucepan and sauté the onions and garlic for 2 minutes. Add millet, cauliflower, salt and water. Cover and bring to a boil. Reduce the flame to medium-low and simmer for 30 minutes. While the millet is cooking, heat the oil for the gravy in a medium skillet and sauté the onions and mushrooms with the sea salt for about 5 minutes. Add the flour and stir constantly until vegetables are coated. Slowly add the Edensoy, stirring constantly until the sauce thickens. Add the mirin and pepper. Simmer about 10 minutes. When the millet is done, remove from the flame and mash with a potato masher. 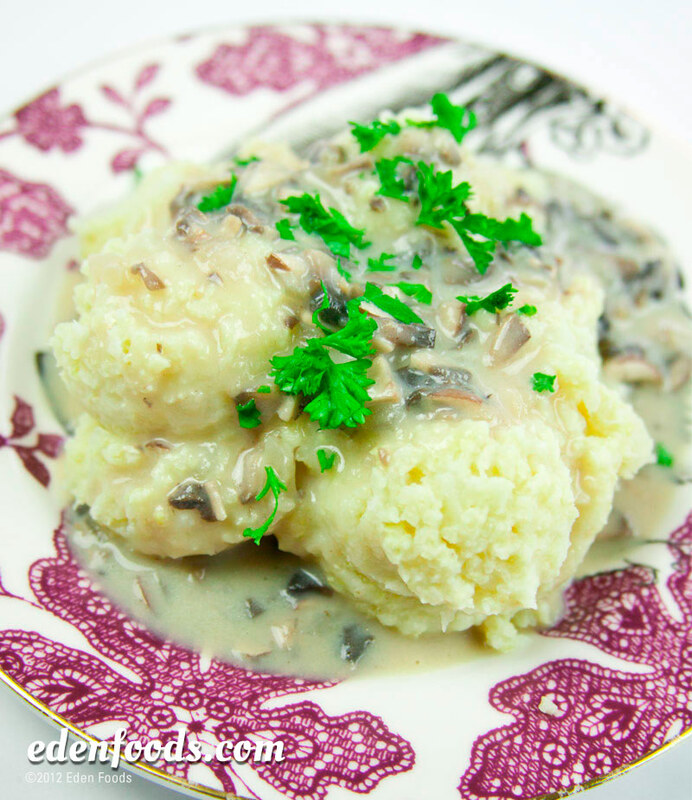 Serve with mushroom gravy ladled over and garnish with parsley.